Probably you think your favorite part of chips and guac is the chips, but if you make really excellent guacamole and serve it with an exciting assortment of vegetables, you might not miss those chips as much as you imagine. Feel free to add whatever you like to this recipe: salsa, chopped tomatoes, even corn kernels. But try it plain first – that’s how we grew to love it after a trip to Mexico, where we were served chunky, simple guacamole seasoned only with lime and salt, and it was absolute perfection. Plus, avocados are such nutritional powerhouses – filled with fats, vitamins, and minerals – that you’ll feel great after eating it. 1. In a bowl, using a fork, mash together the avocado with the lime juice and zest and the salt. Stir in the optional ingredients. 2. 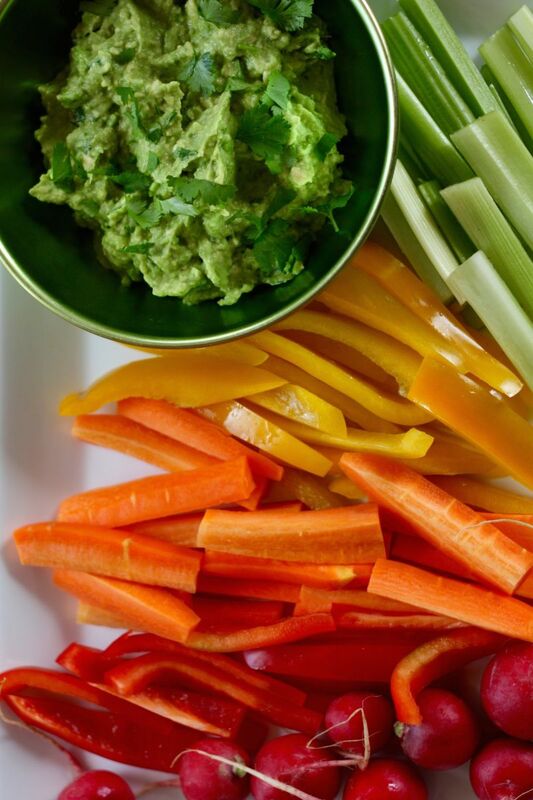 Add salt or lime juice to taste, then serve with raw vegetables for scooping: carrot sticks, bell pepper slices, celery stalks, cucumber spears or slices, green beans, sugar snap peas, and radishes.